Happy Friday! I thought I’d start a new feature where I introduce you to some of my favorite bloggers. Some you might already know, but maybe you’ll learn a little more about them. First up is the lovely Whitney of See Shop Eat Do. 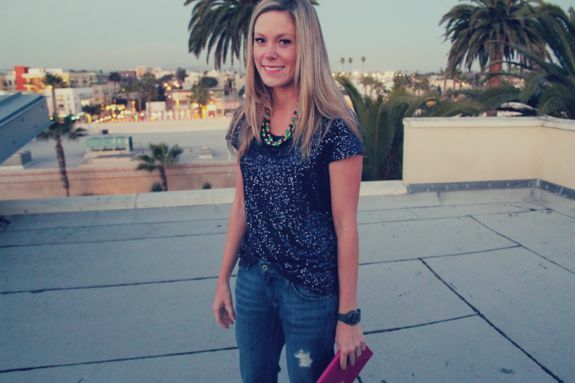 Whitney is a Canadian living in Los Angles and is always going somewhere fun and then sharing the details. Not only does she have killer style, but her shoe collection is what dreams are made of. I have total closet envy! Check out her blog and interview below. I started a few years ago; I was taking a marketing class and as part of a project we had to start a blog. I’m really glad I took the class! What’s the best thing blogging has brought to your life? It has helped to introduce me to some amazing people and I’ve had the opportunity to work with brands that I admire. I love to go to the farmer’s market, ride my bike by the beach, try out new restaurants and do some shopping. What’s your favorite color right this second? Hmmm that’s a tough one! Maybe the crab hand roll from Sugarfish, or the truffle pasta at Hostaria del Piccolo! Other than the essentials, what’s one thing you won’t leave the house without? I always bring a snack with me! Usually a cheese string or a mixed nut package from Trader Joes. I’m always worried about being hungry! Don’t try to copy what other blogs do, be unique. Also be nice and try to make friends with other bloggers as they sometimes have good advice! I also thing that it’s important not to take blogging too seriously – it’s supposed to be fun. For more on Whitney make sure to visit her blog and follow her on twitter and pinterest. thank you so much for this! can’t wait to hopefully meet up soon! Love her! Thanks for the intro. Her blog is so cute! I love Whitney! She’s gorgeous. I had to do a double take. I almost thought it was you. Love her style and tips. pretty girl with lots of style! thanks for sharing! dear, google reader is shutting down so please make sure that you follow my blog through bloglovin’ as well.